How I wrote three books in 30 minutes a day. 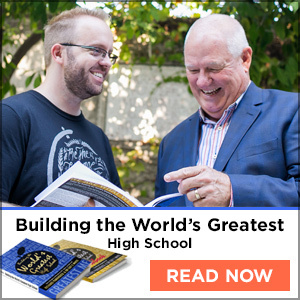 This article is a short version of a longer article that I am writing about writing your first educational book (or any book for that matter). As a teacher, how do you write a book in only 30 minutes a day? I have a time machine. That’s my secret to getting so much done in such a short span of time. That’s how I’ve been able to write 3 books while being a dad, a teacher, and a husband. As I mentioned in this article, my time machine is a system of practices that I employ every day to keep my many projects moving forward. Don’t write chronologically cover to cover. Instead, write one-sentence that sums up the purpose of the book. Then, write a list of 10-15 separate, supporting sentences (ideas) that each support the purpose of the book, these sentences become your chapters. Then, decide what sections are going to appear in all your chapters (intro, main ideas, summary) and add those section headers to your chapters. Set a target number of pages for each chapter. Ten pages or more (1.5 spaced at 12 point font) is a good number. Think about how many pages you want in the book as a whole. Use other books as a comparison. Finally, start filling in the sections. If your intention is to write a book, you need to get into the practice of writing as one of the first (if not the first) activities of your day. Use a timer; write for 30 minutes without exception. I write five days a week no matter what. After meditating, it’s the first thing that I do. As you are writing, notice how many pages you are able to write within that time frame. You can do some simple math to see how long it will take to write your book. Your book as a whole needs a story to hold it together. Even if you are writing a non-fiction text, it still needs some sort of story. That’s the “big story” of your text. Each chapter also needs a story that supports the main idea of the chapter. These smaller stories can be part of the larger “big story” or they can be other slightly-connected stories. It’s your call. In the end, writing a book is mostly about discipline. There is most definitely a science in getting one finished. What’s holding you back from finishing your book? What questions do you have for me about getting your book out there?